We were in St. Louis last week for my followup cardiologist appointment, which went well. We had a great visit with the kiddos and had time for a little shopping one afternoon. They are in the middle of a major kitchen renovation to their 1906 home, which had last been redone in the 70's. It was really the perfect timing, since upon inspection, their electrical system was bordering on dangerous. They have a makeshift kitchen in the basement, so we stayed at a hotel to keep out of the way, and stress to a minimum. But last week when we stopped back by, they were still there, and this time I didn't hesitate to make the purchase. They have some nicks and scratches on the wood, but nothing a little "Old English" didn't take care of. They are in my new color palette I'm going to be using at the new house. Grays, taupes, golds, browns, with a little chartreuse...maybe, if I can find the right color and not chicken out. A lot depends on finding the "right" rug, which will determine several color and fabric choices. 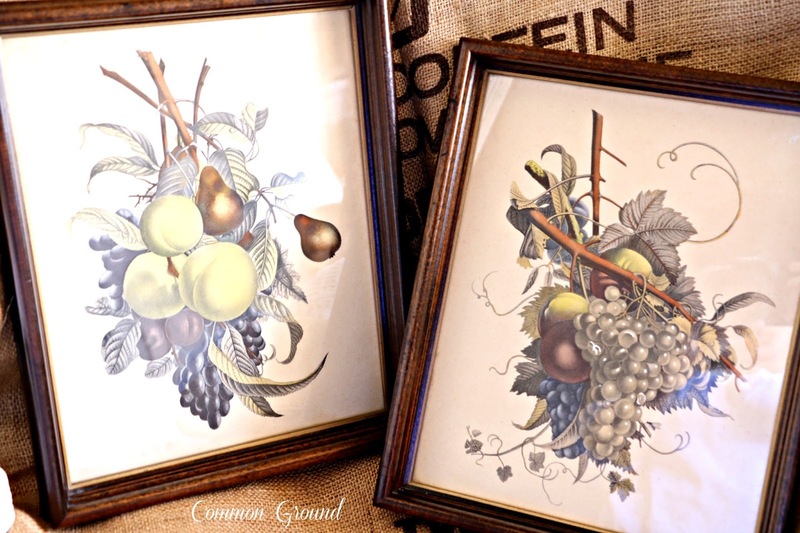 I have another set of vintage fruit botanicals that I may try to incorporate in a grouping. These will make wonderful companions, as the other ones include "pears" too. You can't see it, but the prints have some interesting foxing; no identifying marks, though. I'm still gathering ideas on wall paint. The more I've looked, the more I think I'll go a lighter shade of gray/greige. 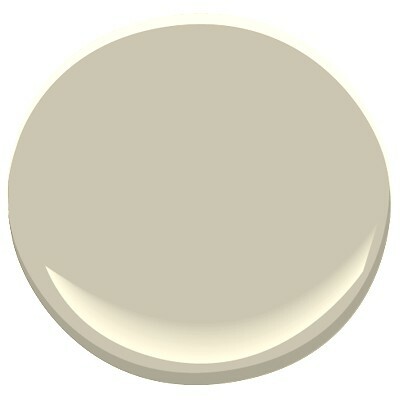 Maybe this might be a little closer, Coastal Fog by Benjamin Moore. I don't want to get into anything that's too dark. Just a little contrast with the white woodwork and moldings. I'm going to be mixing some darker wood pieces with my chippy whites and soon-to-be-taupes at this new place. now, to figure out what to do with the tv niche above the fireplace...yuk. I'm not a tv above the fireplace kinda gal. OK, just wanted to say Hi, and let you all know what I've been up to. So happy to hear that you have found a house and that your Dr appointment went well. Sounds like everything is going well. The prints are very lovely and can hardly wait to see your new house. Enjoy your time with your family and have a wonderful week. Glad your cardiologist appointment went well! Close up the tv gab and make it a solid wall again maybe? I wouldn't keep it if you aren't going to have a tv there. I too am not a fan. In fact I don't even keep our tv IN the living room, there is a small tv upstairs dedicated for tv viewing, which is nearly never in our home. I hope that you cardiologist visit went well means you are getting better. I dont't like tv's above a fireplace either, close it up and made a solid wall. Love the color scheme your going with, and will enjoy the journey of seeing you make this place your home! 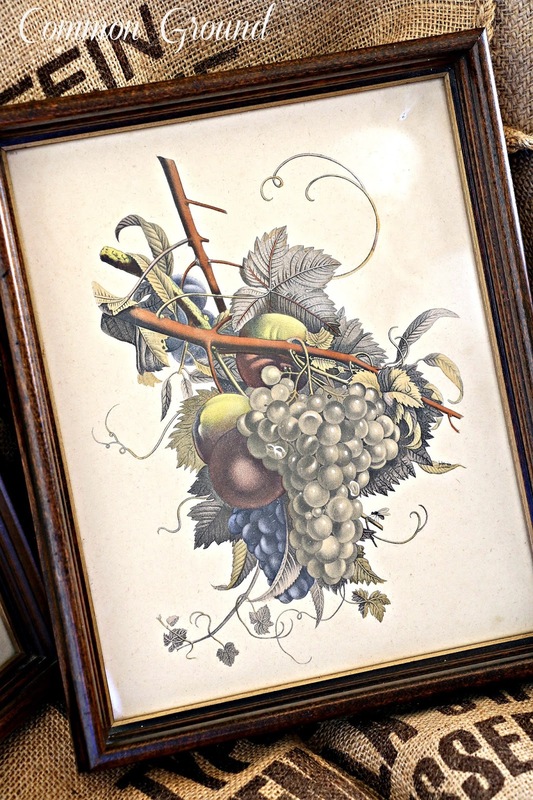 Love your new prints, Debra! I'm excited to see them in place in your new house, as well as that new paint color. I'm always looking for paint color ideas. That niche might be a nice place to hang a focal piece of artwork. I can't remember what you have offhand, but I'll bet you already have something that will work there. A big congratulations on your new place! Few things more exciting! Your new scheme sounds beautiful. I'm so glad things are going well. Hugs for you! J. Love the pear prints. 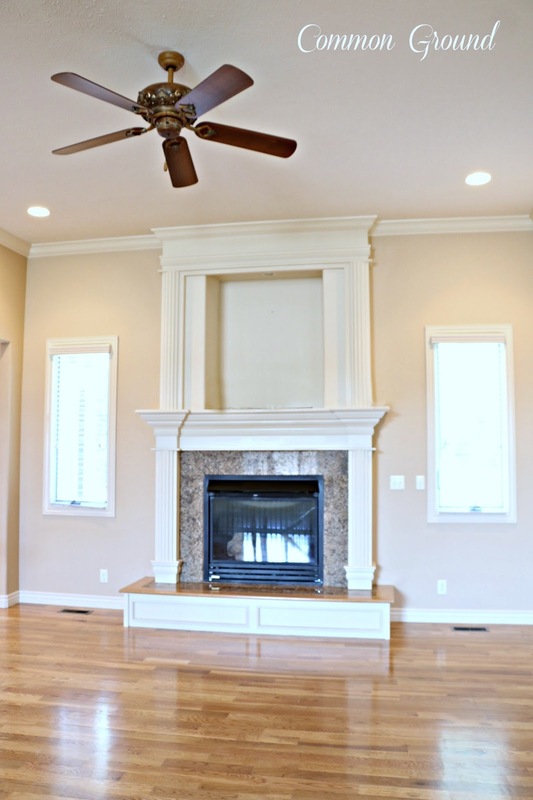 Maybe you could remove the trim on the fireplace and add planks over the opening all the way across the width and height of the fireplace wall. Just a thought. I've been seeing that Coastal Fog color around blogland lately, I'm starting to really like it! I'm sure it will really contrast beautifully with white. I would not like that tv opening above the fireplace, either. The easiest and cheapest way to get around it would probably be to just cover over the opening and make it like a wall. Hi Debra, So happy to hear yur chekup went well. Love you color and prints. I'm watching all you do, I need some inspiration to do a spruce up, way over due here. What a beautiful room! I love the rug and was wondering if you could share where you found it? Thank you!! Glad to hear your doctor appointment went well. And, I see your shopping went well, too. 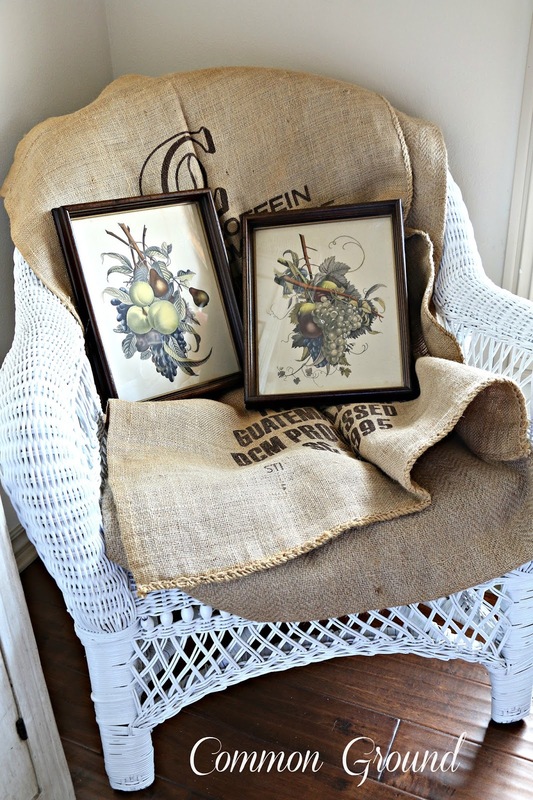 :) The pear prints are gorgeous. 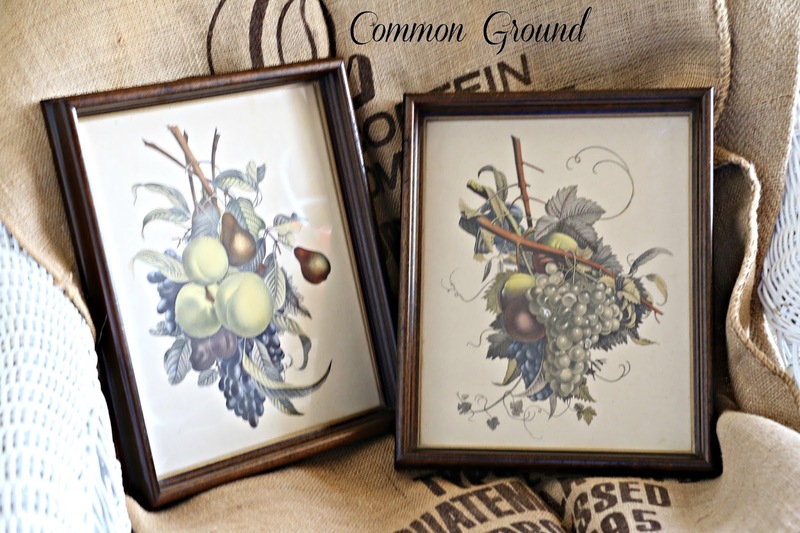 I LOVE botanicals and have some old ones I'm trying to "update"...wrong color frames. Great colors in yours.. somewhat similar to what I'm working with in my family room. Looking forward to seeing what you do above the fire place. I love your idea of chartreuse. I'm using that in our little apartment. Just a smidgen but so delightful. I'm happy to know the prints were still there, they are beautiful! I know what you mean about things packed away. Our home was listed at the end of July. We have had lookers, so that is encouraging. We are so glad we leased the little apartment! Great getaway! Charming...I can't wait to see your touch in your new digs. :) I'm using quite a bit of pale greiges in my home, too, and I love them. Warm, but neutral. Easy to change a room up with just a change of accessories! That's the most fun part anyway. Debra, so glad to hear that your appointment went well! I love those prints. The colors are so pretty! How exciting to be starting on a new home. I can't wait to see your new place! Your new house is going to be so much fun, Debra! You are so talented and I can't wait to see what you do. So glad you appointment went well and hoping you feel great. Those pear prints are elegant, dear one!!! Love the subtle, muted hues within each print. in my dining room here on my side of the Prairie. Although, I'm keeping my RED. . .still lovin' it! 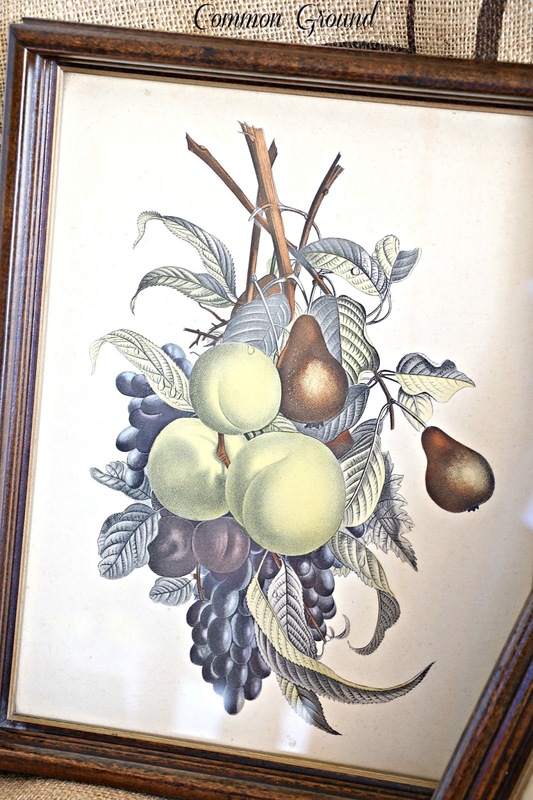 within the Traditional Waverly Fruit motif wallpaper. Glad you're getting inspired about your move. I am excited to see how you interpret the TV niche! Can you EVER have too many botanical prints? I think not... and those are lovely! Good news all around. You new home is going to be beautiful. I suspect that niche will be used creatively, knowing you! I'm so excited for you. I love the prints. I'm not a T.V. above the fireplace lover either. It is too high for comfortable viewing. It will look cute after you get your hands on it.